It has taken me a ridiculously long amount of time to photograph this skirt considering I have worn it a lot, but here it is! My Megan Nielsen Brumby Skirt. 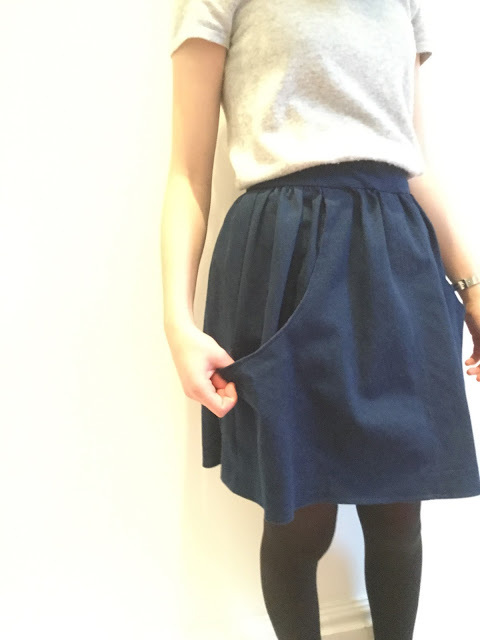 I love so much about this skirt, from the gorgeous deep pockets to the amazing contrast zip. 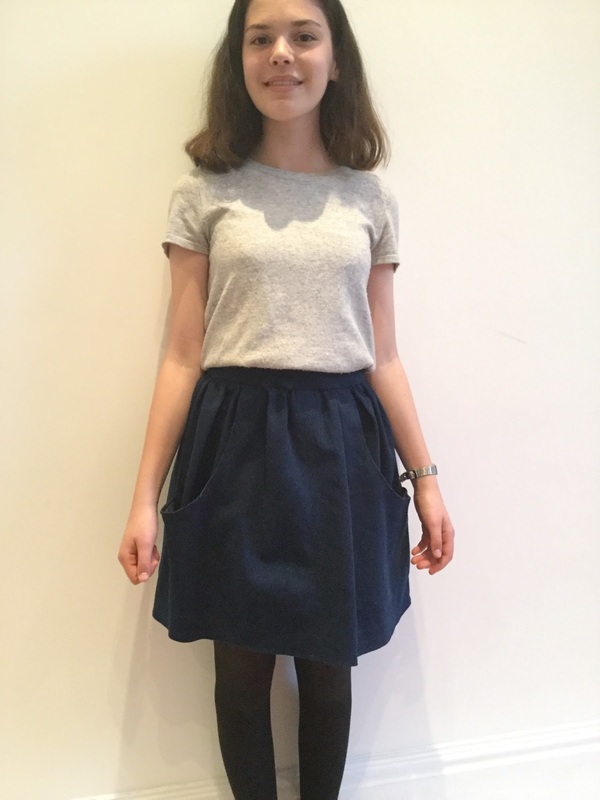 I bought the fabric and pattern to make this skirt when I went to Guthrie and Ghani (you can read my posts about the fabrics that I bought here). The pattern includes 3 versions, I decided to make version 1. What I love about the different versions of this skirt is how different they look made out of different fabrics. I chose quite a stiff denim to make my skirt in, and although it has worked well I think that I would like to try it again in a more lightweight fabric such as a chambray. I love the colour of this denim, as well as the metallic zip that I bought to go with it. The overall look is exactly what I was hoping for. I actually ended up doing the topstitching twice... 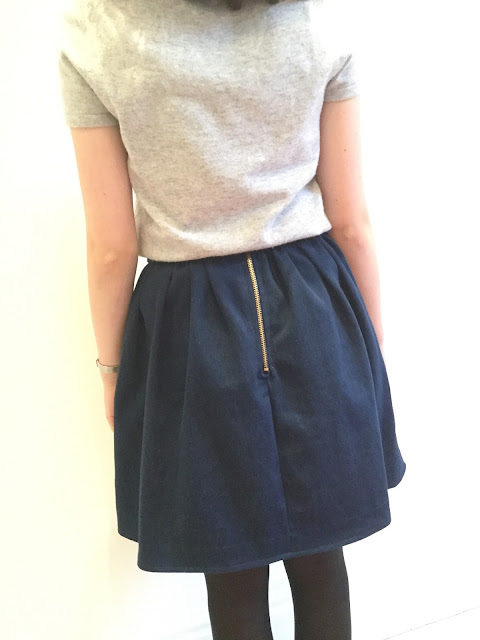 I had originally decided to topstitch the skirt in gold, but found that I just wasn't in love with it. I don't know if it was that the colours didn't match or if I just wasn't in the mood for some gold topstitching, but I unpicked all of the topstitching and then re-sewed it in a matching colour thread. It took a while, but I'm happy I did it as I think it looks much nicer, and I really like the subtle effect that the matching top-stitching gives. I sewed a double row of stitching 4 cm apart at the hem as well as a double row down the centre seam. I really like how this looks, I think I've said before how much of a fan I am of small details like this! I'm also a big fan of secret details, which is one of the reasons why I love the pockets... as well as being amazing, the pockets also give you the option of sewing the pocket lining in a contrast fabric. I bought 20cm of Liberty fabric at the Birmingham rag market very cheaply (for Liberty!) at the same time as I bought this one. I absolutely love this print, and I feels very special to have it lining the pockets. I also used it to line the waistband, which makes me smile every time I put the skirt on. This is why secret details are the best! This was my first time using a Megan Nielsen pattern, but it definitely won't be the last. As well as being beautifully packaged, her patterns are all stunning and it's so tempting to make a whole wardrobe full of them. This outfit looks so cute on you! Those skirt pockets are great! It's never fun to have to unpick your stitches, but I have learned that if you aren't happy with something, it won't get worn and it's best to invest the time to make yourself happy with it...especially when you have already invested time to make it. Lovely skirt! And I agree about adding secret details!